Win the battle and ascend to victory! Ready yourself for Ashes: Rise of the Phoenixborn, the breathtaking first release in our newest expandable game system from acclaimed designer Isaac Vega. Featuring visionary art by Fernanda Suarez, Ashes: Rise of the Phoenixborn introduces the world of Argaia, where powerful Phoenixborn have saved humanity and now face off against each other to claim ultimate godhood. Choose a Phoenixborn -- a powerful demi-god and magic-wielder. Summon faithful allies and dangerous creatures. Combine powerful spells. Outwit your opponents in a fast-paced back and forth barrage of well-crafted magic and strategic skill. Choose your first hand! The First Five mechanic allows players to start the game with five cards of their choice giving them a solid footing in the direction they intend their deck to work. Use dice as resources! The Dice Pool mechanic gives players the resources that they need to bring out powerful spells and creatures moments after the game begins, while still offering an interesting array of powers on their own. Unique back and forth gameplay! The Player Turns system allows players to choose their targets carefully and consistently plan their strategy around their opponent’s upcoming actions. Turns consist of short actions that keep players engaged and allow for adjustments in play as the round progresses. One master set, three exciting ways to play! Choose a deck and jump right in! 6 Phoenixborn included, each with a pre-built deck and assigned dice, lets you start playing quickly. Build your own deck! With 247 cards and 40 custom dice included, this box alone contains billions of build options. Draft a deck! A group of players can build customized decks together in minutes with the deck drafting rules. Plaid Hat Games is thrilled to publish Ashes: Rise of the Phoenixborn, which will provide hundreds of hours of fun and engaging gameplay to gamers everywhere. The duelling card game arena is sodden with choices. There is the behemoth Magic system with its thousands of cards and ferocious tournament play, an intimidating prospect for new players. 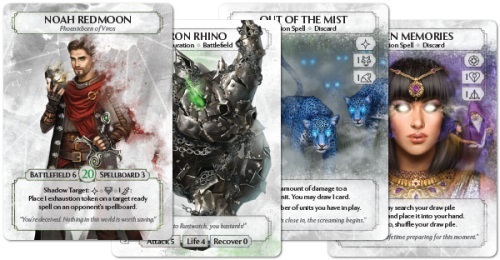 Netrunner has its riveting asynchronous matches marred by a ridiculously steep learning curve enough to send a casual observer into spasms and investing into it is a financially humbling proposal for most. And then there’s the Doom Town’s, Lord of the Rings, Star Wars the list goes ever on. That’s really the issue with LCG’s, TCG’s the expense and the unrelenting pressure of monthly releases. Sure you don’t have to get them all but we’re collectors and once you’ve started on a deck collection, it’s kind of difficult to know when to stop. Let’s be clear I love the idea of playing one of these systems, of pouring over cards and building the decks I just don’t enjoy the damage it applies to my wallet. So Ashes: Rise of the Phoenixborn where does this fit? Well, refreshingly the base box supplies enough cards to build six basic decks. One for each of the Phoenixborn, that’s pretty cool, even if I never decide to alter one deck I still have hours of replayability just there. And while this shares tropes with those games above Ashes has to be applauded for coming at it with a new bag of tricks. Refreshingly the barrier to entry is set low enough that rank amateurs can pick up a deck and get playing. And within a turn they are involved and making deeply satisfying strategic choices, even with the pre-constructed decks each has a distinct feel and synergy. And you never feel that there is ever nothing to do, the design here is such that you always have options you’re always invested. And before we get too engrossed in how all this works I have to pause for a moment to give kudos to the art and design. Fernanda Suarez, the artist responsible for Dead Of Winter’s terrible gorgeousness, has knocked the ball out of the park. Every illustration is worthy of space on my wall and combined with the stark, effective design and iconography from David Richards means each card pops. The whole game has a crisp, assured effortless feel to it. It’s really a thing of beauty. So the game just what’s so great about this? I’m not going to get too engrossed in the rules, the Watch it Played video does it perfectly. So if you want to know how the whole game works take a moment to give that a look. The game pits you in a duel between another of your Highlander like Phoenixborn, imagine if Harry Potter grew up and then became Connor Mccloud and you sort of get the idea, anyway there can be only one. You will battle your opponent reducing their health through spells and conjuring allies who can defend and attack. On your turn, you have the simple choice, either play one main action and/or side action. Main actions are represented by a symbol on your cards and will usually be to play either a spell or ally, or activate the ability on a card you have previously played in your area. If that doesn’t grab you, then you can choose to go straight for the face and attack your opponents Phoenixborn. Any of your units that are active can do this or if the mood takes you target one of her units, and finally you could just pass. Additionally you get that side action, identified by its icon they are usually a buff to another power or chance to draw more cards or in some instances a further way to attack. Meditate is also available or you can use a dice power both of which leads us to this game’s secret weapon the dice. Their addition is a simple but brilliant mechanic that instantly sets this apart from its peers while adding another level of tactics and choice for the player. At the start of a round, both players roll ten dice. When using the included decks, these will be five each of two of the differing schools of magic. The results will be a mix of a Basic icon, Class or Power referred to on a separate reference card. Each of these cards also displays a side action ability that can be activated by using the Power facing if rolled. The inclusion of dice in the game as a resource is a master stroke, it presents a separate level of strategy not available to the other games and instantly sets it apart. Spent when casting your spells or activating abilities, they determine how you’ll play that round. And if you’re worried that rolling a weak pool will leave you flailing then you can Meditate. Meditating allows you to discard any number of cards from your hand, in front of you or from your deck to change the facings on that many dice to whatever you want. I’ve played all of the pre-constructed decks now, and while some seem more powerful than others, certainly Coal Roarkwin and his onslaught of Iron Rhino’s has been proving an issue. As much as Aradel Summergaard and her mixture of offensive ally shredding spells and buffs have seen my enemies crushed and more than a little lamentation on their part. I suspect that is down to finding each characters unique ability’s and play style. I’m still trying to get a handle of Jessa Na Ni who’s rocking this cool voodoo princess vibe and host of gnarly spells to match. This is a game where you need to cast aside any preconceived notions or knowledge of playing these types of games and look again, each Phoenixborn has a unique play style, some more readily evident than others. Now who this is for is a good question. I strongly suspect that Netrunner and Magic players may initially be put off with the perceived simplicity of the game, each Phoenixborn’s deck only contains three each of its ten cards. That limited pool may be seen as a weakness, but it’s this leanness that allows for the game to avoid stalling and offer the choices it does each round. The manipulation of the dice is enthralling as you’re always watching what your opponent is doing with them. After the first couple of rounds, you’re going to know what facings they have been using and so when they Meditate and flip those dice you’ll be preparing yourself for the pain. It’s a TCG for people who don’t play TCG’s, yet at its core it’s also a hugely rewarding game for players who do. I’ve yet to immerse myself in the games deckbuilding or drafting. I can already see beyond the base decks that it’s here the game is going to gain its legs. The suggested builds are entirely satisfying and in truth I’m enjoying developing the knowledge to play them optimally. But I’d be fooling myself if I didn’t say I’m salivating at what combinations I can compile from those cards and dice. If tomorrow Plaid Hat declared Ashes done with this box then I’d still recommend this. It’s a solid and complete game that offers a tremendous amount of replayability and value for money, but of course they won’t. They have already confirmed that future decks will be released but in a much more wallet-friendly fashion with potentially one big box a year and personally I can’t wait to see this game grow. I can’t quite put my finger on why, its a kind of magic. I got this game at Christmas and played for the first time this week. The first thing I must say about this game is the that the quality of the Art on the cards is simply amazing. Fernanda Suarez did an incredible job in rendering a fantasy setting that as a lot of potential and that looks and feel different from most of the other card game I own. That being said, let’s jump into the review of the game play itself. It’s a pure PvP game that can be played by 2 to 4 players. There is absolutely no co-ops option. So if PvP is not your style, this game is not for you. Out of the box come 6 pre-made deck that are ready to use. I would recommend using those for your first few games. They are diverse enough in play style that it will give you a good idea of what you like to play before you jump into constructing your own deck. There is also a draft option which I have not tried yet but that looks interesting. What differentiate this game form a lot of other card games is the fact that it contains dice that act as your Mana pool. It adds a layer of strategy to how you will play your cards, but it also adds a layer of pure luck of the role as you might be stuck with not being able to play you most powerful abilities. All in all , after having played several games, I really like the mechanic of the game and how the different character give a different feel to each game. 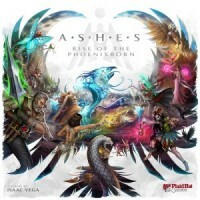 Add a Review for "Ashes: Rise of the Phoenixborn"